As the UBS story unfolds, we clearly see that banks still believe the story that they have been telling over the years. The story of the recent “rogue trader” loss is that he made large trades and faked the offsetting position. That makes sense only if you believe the story that the traders have been telling for years that it is not the gross positions, but the net positions that count. RISKVIEWS wonders at what ultimate cost they will hold onto that idea? The other similar idea is that the notional amount of a derivative is not important, just the price and the recent price volatility. You see, the gigantic gross position with another gigantic gross position offsetting is just like a derivative contract. So the two ideas are really the same. And both totally wrong. They are only correct if things stay nice and tame. But the flaw in the two arguments is that things are not really guaranteed to stay tame. Haven’t the banks noticed that yet? When things are not tame, the recent price volatility is not any indication of future volatility. The amount of the notional becomes a giant level that can catapult the bank sitting with lots and lots of notional right out of the playroom. It is starting to seem like the banks are making decisions on what ideas that they will believe based upon a a Peter Pan system. If they close their eyes and really, really believe then things will go back to when the playroom was really, really fun and they made lots and lots of money. When things are not tame, those two gigantic offsetting positions are not guaranteed to move in opposite directions. Doesn’t anyone remember why LTCM went bust? For heavens sake, some of the offsetting positions that they lost hundreds of millions on were treasuries with only slightly different maturities. THERE ARE NO RELIABLE OFFSETS. Banks may want to consider a simple rule that is used by insurers. For large transactions, have a limited number of responsible individuals who must personally authorize. (Note to bank HR departments – need to hire some.) For extremely large transactions require that the CEO personally authorize. For multi Billion transactions, require board approval. Why would any rational person who is running a bank give a trader on a desk authority to make a two billion transaction, even if there is supposed to be an offset somewhere? What sort of playroom is a bank trading desk? But the most important question, in RISKVIEWS mind, is why would anyone give these folks their hard owned money to go out and gamble like that, offsetting positions or not?????????? The insanity WILL continue until investors get some sanity and insist on only giving money to banks that have sensible and transparent risk management rules that they actually follow. Independence of the risk function is very important. But often, the wrong part of the risk function is made independent. It is the RISK MEASUREMENT AND REPORTING part of the risk function that needs to be independent. If this part of the risk function is not independent of the risk takers, then you have the Nick Leeson risk – the risk that once you start to lose money that you will delay reporting the bad news to give yourself a little more time to earn back the losses, or the Jérôme Kerviel risk that you will simply understate the risk of what you are doing to allow you to enhance return on risk calculations and avoid pesky risk limits. When Risk Reporting is independent, then the risk reports are much less likely to be fudged in the favor of the risk takers. They are much more likely to simply and factually report the risk positions. Then the risk management system either reacts to the risk information or not, but at least it has the correct information to make the decision on whether to act or not. Many discussions of risk management suggest that there needs to be independence between the risk taking and the entire risk management function. This is a model for risk disaster, but a model that is very common in banking. Under this type of independence there will be a steady war. A war that it it likely that the risk management folks will lose. The risk takers are in charge of making money and the independent risk management folks are in charge of preventing that. The risk takers, since they bring in the bacon, will always be much more popular with management than the risk managers, who add to costs and detract from revenue. Instead, the actual risk management needs to be totally integrated within the risk taking function. This will be resisted by any risk takers who have had a free ride to date. So the risk takers can decide what would be the least destructive way to stay within their risk limits. In a system of independent risk management, the risk managers are responsible for monitoring limit breaches and taking actions to unwind over limit situations. In many cases, there are quite heated arguments around those unwinding transactions. Ultimately, it would be preferable if the risk taking area would totally own their limits and the process to stay within those limits. However, if the risk measurement and reporting is independent, then the limit breaches are reported and the decisions about what to do about any risk taking area that is not owning their limits is a top management decision, rather than a risk manager decision that sometimes gets countermanded by the top management. High speed trading ran amok on Thursday, May 6. It sounds like exactly the same thing that lead to the 1987 market crash. There never was an explanation in 1987 and there most likely will not be one now. Why not? Because it is not in the interest of the people who are in a position to know the answer to tell anyone. Look, the news says that this high speed trading is 75% of the volume of trading on the exchanges. That means that it is probably close to 75% of the exchanges revenue. Most likely, the answer is that this sort of crash has always been possible at any time of any day with computers sending in orders by the thousands per minute. The people who programmed the computers just do not have enough imagination to anticipate the possibility that no one would want to take the other side of their trade. Of course this is much less likely if someone actually looked at what was going on, but that would eliminate 90% of that volume. Back before we handed all of the work to computers, the floor brokers who were the market makers would take care of these situations. The exchange, that is benefiting from all of this volume, should perhaps be responsible to take some responsibility to maintain an orderly market. Or else someone else should. The problem is that there needs to be someone with deep pockets and the ability to discern the difference between a temporary lack of buyers or sellers and a real market route. Oh, that was the definition of the old market makers – perhaps we eliminated that job too soon. But people resented paying anything to those folks during the vast majority of the time when their services were not needed. The problem most likely is that there is not a solution that will maintain the revenue to the exchanges. Because if you brought back the market makers and then they got paid enough to make the very high risk that they were taking worth their while, that would cut into the margins of both the exchanges and the high speed traders. Just one more practice that is beneficial to the financial sector but destructive to the economy. After the 1929 crash, many regular people stayed out of the markets for almost 50 years. It seems that every year, we are learning one more way that the deck is stacked against the common man. In poker, when you sit down at the table, it is said that you should look around and determine who is the chump at the table. If you cannot tell, then you are the chump. As we learn about more and more of these practices that are employed in the financial markets to extract extra returns for someone, it seems more and more likely that those of us who are not involved in those activities are the chumps. Something as massive as the current financial crisis is much too large to have one or two or even three simple drivers. There were many, many mistakes made by many different people. My mother, who was never employed in the financial world, would have cautioned against many of those mistakes. When I was 16, I had some fine arguments with my mother about the girls that I was dating. My mother did not want me dating any girls that she did not want me to marry. That was absolutely silly, I argued. I was years and years away from getting married. That was a concern for another time. My mother knew that in those days, “shotgun marriages” were common, a sudden unexpected change that triggered a long-term commitment. Well, as it happened, even without getting a shotgun involved, five years later I got married to a girl that I started dating when I was 16.
will. Using that approach, they can exploit little bits of risk insight to trade ahead of market drops. But when the news reveals a sudden unexpected adverse turn, the trading away option often disappears. In fact, using the trading option will often result in locking in more severe losses than what might eventually occur. And in the most extreme situations, trading just freezes up and there is not even the option to get out with an excessive loss. So the conclusion here is that, at some level, every entity that handles risks should be assessing what would happen if they ended up owning the risk that they thought they would only have temporarily. This would have a number of consequences. First of all, it could well stop the idea of high speed trading of very, very complex risks. If these risks are too complex to evaluate fully during the intended holding period, then perhaps it would be better for all if the trading just did not happen so very quickly. In the case of the recent subprime-related issues, banks often had very different risk analysis requirements for trading books of risks vs. their banking book of risks. The banking (credit mostly) risks required intense due diligence or underwriting. The trading book only had to be run through models, where the assignment of assumptions was not required to be based upon internal analysis. From 2008 . . .
Lots more great stuff there. Check it out. Bad risk model (Gaussian). That ignore abnormal market conditions. Ignoring the fact that others in the market all have the same risk management strategy and that that strategy does not work for the entire market at once. Mark to Model where model is extremely sensitive to assumptions. Using models that were not designed for that purpose. Assumption of continuously liquid markets. Risk management system too rigid, resulting in easy gaming by traders. Fundamental flaw in Limited Liability system. No one has incentive to put a stop to this. Moral Hazard is baked into the system. Unfortunately, there are two flaws that I see in his paper. First, he misses the elephant in the room. The actual exposure of the financial system to mortage loan losses in the end was over 400% of the amount of mortgages. So without the multiplication of risk that happened under the guise of risk spreading had not happened, the global financial crisis would have simply been a large loss for the banking sector and other investors. However, with the secret amplification of risk that happened with the CDO/CDS over the counter trades, the mortgage crisis became a depression sized loss, exceeding the capital of many large banks. So putting all of the transactions out in the open may have gone a long way towards allowing the someone to react intelligently to the situation. Figuring out a way to limit the amount of the synthetic securities would probably be a good idea as well. Moral Hazard is a term from insurance that is important to this situation. Insurable interest in one as well. The second flaw of the paper is the standard Cato line that regulation should be eliminated. In this case, it is totally outrageous to suggest that the market would have applied any discipline. The market created the situation, operating largely outside of regulations. So while I liked most of the movie, I hated the ending. We really do need a Systemic Risk Regulator. And somehow, we need to create a system so that 50 years from now when that person is sitting on a 50 year track record of no market meltdowns, they will still have enough credibility to act against the mega bubble of those days. This is the final post in a 10 part series. Of the ten suggestions, this one has the most value by far. Unfortunately, this one may be the suggestion that has the least chance of being taken up. No one is talking about any part of this. We seem to be moving to try to set the world back into the place that is was, or very close to it. We should be asking “What should be the place of banking in our economy?” This is not a question of allowing the free market to choose. The free market has nothing to do with this. The role of the banking sector is entirely determined by the government. 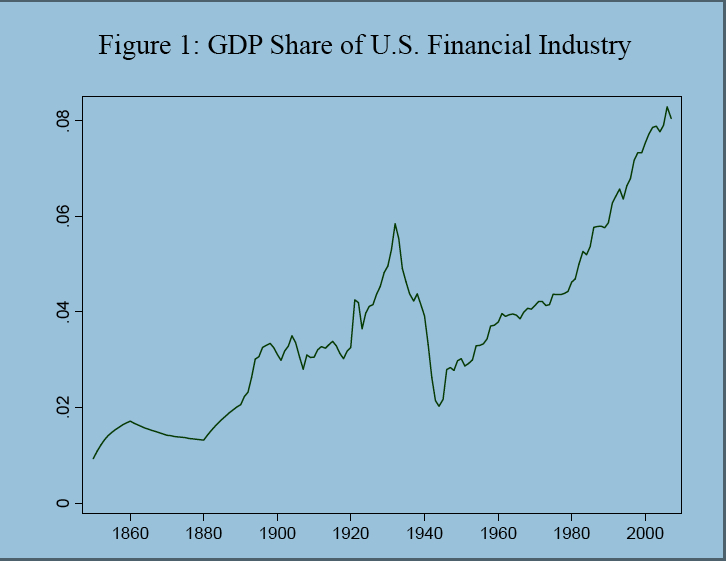 The banking sector had grown to eat up a huge percentage of all of the profits of the entire economy. Does that make any sense to anyone? Banking can be a symbiont with the economy or it can be a parasite or it can be a cancer. Before the crisis, banking had definitely moved beyond the level of parasite to becoming a harmful cancer. Too much of all of the profits of all of business activity in the entire economy were being diverted to the banks and with the pay structure of the banks, into the pockets of a very small number of bankers. Did that make any sense whatsoever? Is there any way that anyone can show that situation makes for a healthy economy? The bubbles that happened twice could be seen as the way that bankers justified their huge take from the economy. If values were growing rapidly, no one seemed to mind that bankers took so much out of the deals. However, if the economy and the values of businesses and assets in the economy grow at only a sane pace, and bankers try to go back to the level of take from the economy that they have grown accustomed to, then the amount of total profits left for the rest of the economy are bound to be negative. So unless we re-think things and figure out how to muzzle the banks, then we are headed for more bubbles that will justify their stratospheric incomes. The financial sector, once it exceeds a certain share of the economy, should be viewed as a tax on the economy. Many protest the taxes that the government imposes because the money is not well spent. Well, the money from this tax goes to personal expenditures of the bankers themselves. There is not even any pretense that this tax will be spent for the common good. One question that really needs to be answered is how much of this financial “innovation” that is touted as the result is really beneficial to the economy and how much of it is just unnecessary complexity that hides that take of the bankers and hedge funds. The excuse that is always given is that all of this financial innovation helps to provide lubrication for businesses. But that is more like an excuse than a reason. Mostly the financial innovation has fueled bubbles. It has led to the excessive leverage that feeds into one sided deals for hedge fund managers. More often than not, financial innovation has helped to fuel the extreme fixation on short term gains in the economy. Financial innovation has featured hollowing out companies to maximize short term values. Quite often the companies “helped” by this process turn into worthless shells somewhere along the process. This destroys that productive capacity of the economy to allow for the extraction of the maximum amount of short term profits. Financial innovation helps to turn corporate assets into profits and to take those profits out of the firm through leverage. So Taleb’s suggestion that we think through Capitalism 2.0 is a good and timely one. But we need to start asking the right questions to figure out what Capitalism 2.0 will be. Beta is not a stable parameter; also, it does not measure risk well. Company-specific risk is significant, and varies a great deal. The effects on a company with a large amount of debt financing is significant. What did they do in the old days? They added a few percent on to where the company’s long debt traded, less for financially stable companies, more for those that took significant risks. If less scientific, it was probably more accurate than MPT. Science is often ill-applied to what may be an art. Neoclassical economics is a beautiful shining edifice of mathematical complexity and practical uselessness. I’ve also never been a fan of the Modigliani-Miller irrelevance theorems. They are true in fair weather, but not in foul weather. The costs of getting in financial stress are high, much less when a firm is teetering on the edge of insolvency. The cost of financing assets goes up dramatically when a company needs financing in bad times. But the fair weather use of the M-M theorems is still useful, in my opinion. The cost of the combination of debt, equity and other instruments used to finance depends on the assets involved, and not the composition of the financing. If one finances with equity only, the equityholders will demand less of a return, because the stock is less risky. If there is a significant, but not prohibitively large slug of debt, the equity will be more risky, and will sell at a higher prospective return, or, a lower P/E or P/Free Cash Flow. Securitization is another example of this. I will use a securitization of commercial mortgages [CMBS], to serve as my example here. There are often tranches rated AAA, AA+, AA, AA-, A+, A, A-, BBB+, BBB, BBB-, and junk-rated tranches, before ending with the residual tranche, which has the equity interest. That is what the equity interest is – the party that gets the leftovers after all of the more senior capital interests get paid. In many securitizations, that equity tranche is small, because the underlying assets are high quality. The smaller the equity tranche, the greater percentage reward for success, and the greater possibility of a total wipeout if things go wrong. That is the same calculus that lies behind highly levered corporations, and private equity. All of this follows the contingent claims model that Merton posited regarding how debt should be priced, since the equityholders have the put option of giving the debtholders the firm if things go bad, but the equityholders have all of the upside if things go well. So, using the M-M model, Merton’s model, and securitization, which are really all the same model, I can potentially develop estimates for where equities and debts should trade. But for average investors, what does that mean? How does that instruct us in how to value stock and bonds of the same company against each other? There is a hierarchy of yields across the instruments that finance a corporation. The driving rule should be that riskier instruments deserve higher yields. Senior bonds trade with low yields, junior bonds at higher yields, and preferred stock at higher yields yet. As for common stocks, they should trade at an earnings or FCF yield greater than that of the highest after-tax yield on debts and other instruments. Thus, and application of contingent claims theory to the firm, much as Merton did it, should serve as a replacement for MPT in order to estimate the cost of capital for a firm, and for the equity itself. Now, there are quantitative debt raters like Egan-Jones and the quantitative side of Moody’s – the part that bought KMV). If they are not doing this already, this is another use for the model, to be able to consult with corporations over the cost of capital for a firm, and for the equity itself. This can replace the use of beta in calculations of the cost of equity, and lead to a more sane measure of the weighted average cost of capital. Values could then be used by private equity for a more accurate measurement of the cost of capital, and estimates of where a portfolio company could do and IPO. The answer varies with the assets financed, and the degree of leverage already employed. Beyond that, CFOs could use the data to see whether Wall Street was giving them fair financing options, and take advantage of finance when it is favorable.